"I took the garbage out yesterday - you do it today." "I already changed three diapers today, it's your turn!" "I walked the dog this morning in the freezing cold, you'd better do it tonight." This post is part parenting discussion and part personal plug. You may recall an older post of mine which linked to an article I wrote for the OU discussing how to influence one's children towards better behaviors. In it, I cite the obvious principle that lecturing children (especially young children) is a brilliantly ineffective way to do so. Children do not respond to lectures. They respond to visual cues, rhymes and rhythms, modeling, and stories. Thus, when we were facing an issue with my older daughter of her being rather bossy with her friends and her younger sister, rather than try to explain to her why this was problematic, I wrote a little book about it (with the help of Bat-Sheva Kivelevitz, my intrepid illustrator). I can't tell you that the book was a magical success, but I can tell you that we don't really have this problem anymore. So it seems to have at least been part of the solution. Likewise, early on my younger daughter was having trouble sharing. So I wrote a book for her at her level to help her understand how and why to share. Again, I don't know how much it contributed, but I can tell you that now she is very proactive about sharing. It was actually a rather long process to finally make these available to the public once I decided to do so, but now here they are! Bossy Baila and I Share are available on Amazon.com and CreateSpace.com. And they make great gifts for all your pre-school friends! Bossy Baila is great for around the ages of 4-6, and I Share is more for younger children, perhaps 2-4. Note that although I expect these books will be helpful for children of any background, they are written primarily for the Orthodox community (e.g. the names, illustrations, etc.). Actually, they are written primarily for my daughters. I didn't really intend to formally publish them when I wrote them. But here they are! So now pass it on. 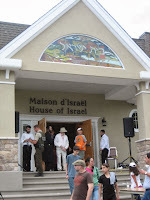 We are going to be scholars in residence of sorts at House of Israel in Ste. Agathe Des Monts, Quebec (about an hour outside of Montreal) this Shabbos. (I say scholars, plural, because really it's my wife they want to hear. She will be speaking about her life's journey from being born in South Korea to becoming a rebbetzin.) If you're in the area, it's a great place to spend Shabbos!